As seniors continue to age, they often become at risk for a number of new and serious health conditions and physical side effects. One of the common conditions that is often associated with the aging process is known as Dowager’s Hump. This is a general term used to describe the stooped appearance that many people develop as they age and the hump in the upper back that starts to form. So, What is Dowager’s Hump? This condition can impact any senior, but is most common in women. Dowager’s Hump is a non-medical term used to basically describe a forward bending of the spine over age. With time, the upper back starts to develop an outward curve or a “hump.” As the person starts to lean forward, their shoulders begin to slouch and their backs begin to round. This creates the hump like appearance. The hump develops over time, and you may notice your senior getting more and more of a hump as they age with the curvature becoming more and more noticeable. Many times, this hump starts as a fatty deposit at the base of the neck and begins to worsen over time. The progression typically happens because of small micro-compression fractures in the vertebrae that develop when seniors lean forward too much. There are a number of factors that could lead to the development of Dowager’s Hump. One of the most common is osteoporosis, which is likely the reason why more women tend to have this hump than men. 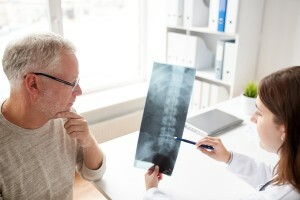 People who have osteoporosis often also have a condition known as kyphoscoliosis, which are bone deformities that can give the appearance of the “hump” along the spine. Some research has even found that certain medications can cause an increase in the likelihood of developing this type of spinal curvature. In fact, this is a common risk associated with many AIDs treatments. Seniors who have Cushing’s syndrome, which leads to excess cortisol production can also increase a person’s chances of developing this spinal hump. Long-term steroid users are also more likely to develop this condition. It is important to note that steroids can often be found in numerous medications, including asthma inhalers, so many seniors may actually be taking more steroids then they assume. While certain medical conditions and treatments may be associated with this hump, most experts believe the most common issue has to do with posture. Over time, many seniors struggle with their posture, increasing their chances of developing the hump. Also, individuals who spend years leaning forward over a desk or computer are more likely to develop this condition. The good news about this condition is that it can be treated. If left untreated, seniors may develop serious pain and discomfort and even spinal degeneration over time. The best way to treat this condition is with regular exercise, which should begin right when the condition first starts to appear. Working with a chiropractor or physical therapist on different neck, shoulder, back and abdominal exercises can help restraighten the spine and prevent the issue from worsening.